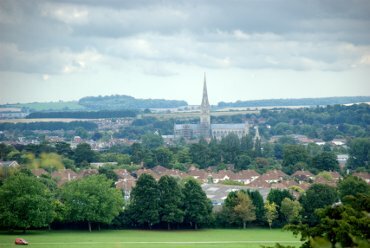 The city of Salisbury seen from the outer bank of Old Sarum. An Iron Age camp stood on a hill a few miles south of Stonehenge. The Romans then strengthened it and later the Normans built a castle and cathedral on it calling it Sarum. It became apparent that the site was not large enough to accommodate the authority of both Church and castle and so a new cathedral was started a few miles to the south. This site was called New Sarum which later became Salisbury. The site of the old city became known as Old Sarum which is where this photograph was taken from. We stayed at the Danebury Hotel, Andover for this visit in 2009. Salisbury Cathedral was completed in 1258 - well almost, as the tower and spire weren't added until 76 years later in 1334. This view is from within the Cathedral Precincts. 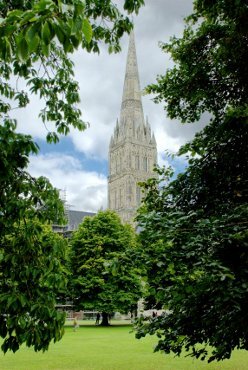 The combined height of the tower and spire is 404 feet making it the highest of any cathedral in England but its central peirs stand on foundations a mere 5-6 feet down in swampy ground and it has stayed there for well over 700 years. Salisbury is Wiltshire's only city and for some reason, which I cannot fathom, it is not the county town. 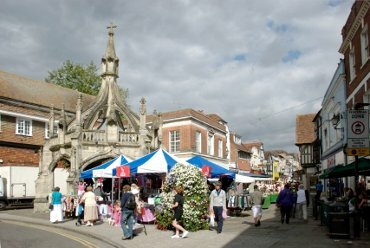 Salisbury used to have four market crosses with each related to a different trade. This is the sole remaining cross and is known as the Poultry Cross. The other crosses were the Cheese Cross, the Wool & Yarn Cross and Barnwell (or Barnard's) Cross which was used for trading livestock. The Poultry Cross was first mentioned in the early 14th Century but the current structure dates from the late 15th Cantury. The other crosses have long since disappeared. 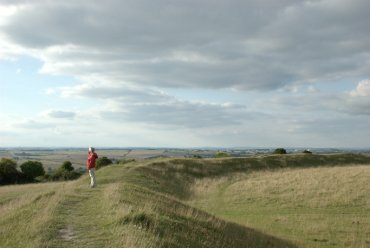 The inner mound of Old Sarum seen from the top of the outer bank. This property is owned by English Heritage who charge a fee for entry to the inner mound. There is a free car park between the inner and outer banks accessed by a very narrow lane and entry to the outer area is free. The cathedral and most of the old town were situated in this outer area with the castle and palace being on the inner mound. Only the foundations of the cathedral remain and very little of the castle. 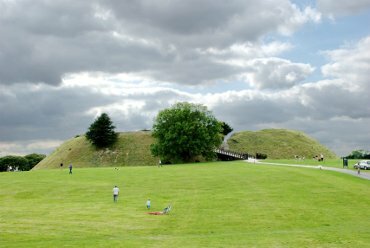 Just a few miles east from Old Sarum is Figsbury Ring - an Iron Age Hill Fort covering some 15.5 acres. Figsbury Ring is somewhat different from other hill forts in Wiltshire in having an internal ditch in addition to the typical external ones. From the south-western edge of the outer bank one can see the spire of Salisbury in the distance on a clear day.